The game has a simple premise. You hand-pick a crew, choose a ship and lander, then head off into the endless void. Your mission? To test humanities latest breakthrough, an engine capable of interstellar travel. While on this maiden voyage, something goes wrong. When the jump drive is activated, it mis-fires, flinging the ship and crew far across the galaxy to an unknown location. They are left stranded, damaged, injured and with scant resources. Can you guide them back to Earth on The Long Journey Home? After you make your starting choices, A little opening level will take you through the basics, this can be skipped on subsequent runs but I'd recommend it the first time through, it gives the basic controls and gameplay hook, as well as helping to set up the story. You'll start with the Lander, on the launchpad, at the beginning of the countdown. You are flying up into orbit, delivering the last member of the crew to a rendezvous with the ship. We then make a pitstop at Mars to pick up a fuel tank before orbiting the sun a few times to harvest its electromagnetic radiation. This powers the EM drive, allowing us to attempt the ill-fated warp jump mentioned earlier. Gameplay wise, you're given a large procedurally generated universe and you explore it by moving around a 2-D birds-eye representation of whatever solar system you are currently exploring. Movement of your craft takes a little practice, you have a thruster on the back of the ship and use it to accelerate, or angle it to make turns. Slowing down is done by facing backwards and boosting, decreasing your momentum. At first, this can be difficult to get to grips with but practice will lead to it becoming easier and way more fuel efficient. You'll need to learn to use little bursts of fuel to just achieve escape velocity and no more, before then slowly drifting off into the void, aiming to be captured in the gravity well of a far-off world or point of interest. This will allow you to "fall" towards it and hopefully slide into orbit without missing because this will cost you fuel for a course correction. After a quick look at the scanner to check what we'll be up against, it's into the Lander to journey to the surface. While piloting the Lander, things change to a side-scrolling viewpoint. Movement works the same way, thrusting will send you vertical or will slow your falling, and you move left or right by angling the jets in the relative direction. Different planets types have differing temperatures, differing gravity strength and differing wind speed. Making a judgement on the risk/reward quickly becomes a necessity as environments can range from harmless to absolutely deadly. You might find the scorching atmosphere is melting the hull, or gravity is so strong that the Lander drops like a rock, its own thrusters unable to stop it before it pancakes across the surface. Once you've successfully entered the atmosphere, you should check your radar for points of interest. You'll find places to harvest resources, ruins to explore, cities to visit and a host of other stuff. Watch out for the Landers hull strength and fuel though, it's possible for it to be destroyed completely. Meaning you'll need a replacement before you can visit any more of the planet based points of interest. Once the Lander is packed with useful stuff, or you've nothing left to search, boost out of the atmosphere and return to the ship. 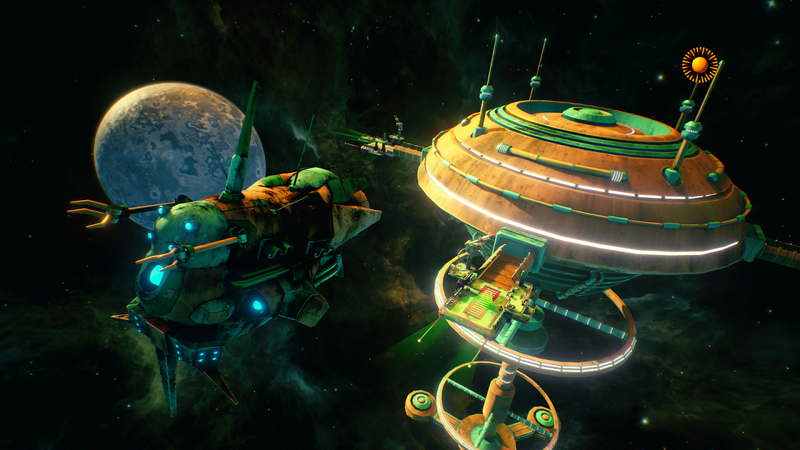 As you explore each solar system, you'll come across various points of interest ranging from the obvious, different planets and moon types, to space stations, alien ships, floating wrecks, asteroid belts and a whole host of other locations. Each of these have various things to do with resource gathering and questing being the main thrust. You can send the Lander down to planets, harvesting fuel and metals to repair and fuel the ship, or even better, to sell for a profit. You can locate ancient ruins and loot them of artifacts and even strike up conversations with a load of different Alien species. All these encounters are text-based with you choosing from a variety of questions ranging across various subjects. Many of the races have quest lines involved with them, unique behaviours that they do and asking them the correct question, doing the right thing or showing the right object, can lead to interesting situations. You might find yourself being entered in a "Ugliest Pet" competition, helping to cheat a casino, entering a space race or helping a young sentient plant to see the universe. All the while, you'll be (hopefully) earning money and upgrading your ship technology, while also searching each cluster for a Stargate-like "Gate-station" floating in space. These allow travel between the different clusters, giving you a whole new load of star systems to explore and each one you journey through is one step more on your journey back to Earth. 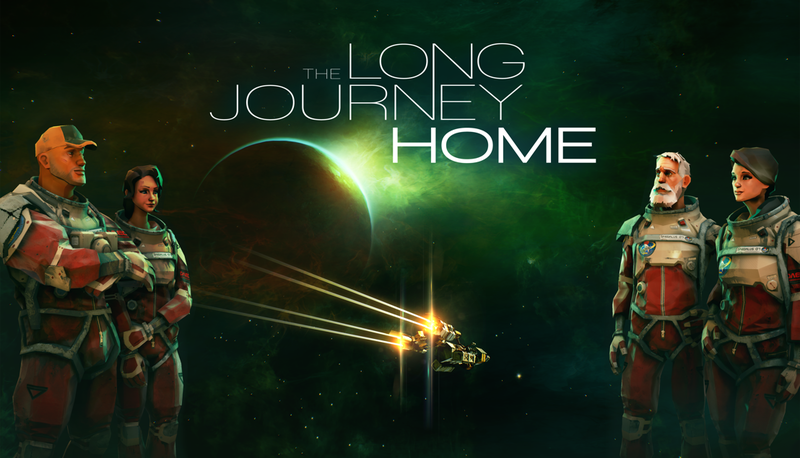 Although you might never see Earth anyway because, and I haven't mentioned this yet, but The Long Journey Home is BRUTALLY difficult. You CONSTANTLY need resources. Fuel burns quickly, the hull seems to take a constant battering, the crew are easily injured and every ship component suffers wear and tear at an alarming rate. Inventory space is really small and managed strictly, further restricting the variety of resources you can carry at once. Repair items and resources are relatively few and far between so don't expect a cake walk, you'll need careful management to get you through, even on the lowest difficulty. Although admittedly the procedural generation can play a part in this. It's possible to start with bad beginnings. You see, the game uses a "seed" system, meaning a 10 digit code is used to control all the different factors in the game like the available species, the layout of planets, allocation of resources etc. Therefore, there are easier seeds and harder seeds. You can take note of easier ones though and play through them again and you can even share them between players, seeking out easier or more challenging ones as needs be. And difficulty wouldn't be my only criticism. Another is the item uses and character skills, they are barely explained sometimes and I quickly found myself turning to the Wikia to make sense of it all. There are items whose purpose is unclear, you have no idea what to do with them, whether it has a secret use or even how much to sell it for. I found this to be a constant with TLJH. It wants you to work everything out for yourself, the game needs time and experimentation to shine but this, along with the difficulty, could easily put people off. 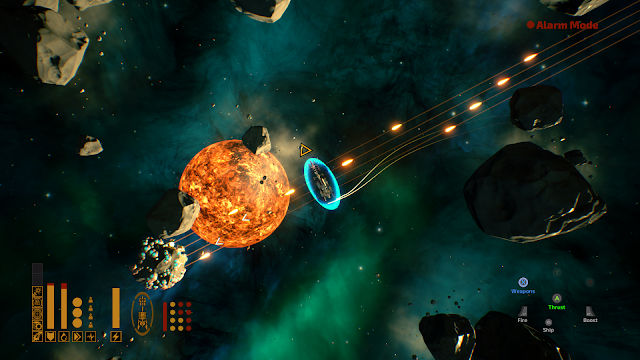 The game also isn't much of a looker, choosing to mostly use an aesthetic styled like a holographic radar display. The Lander sections are similarly simple with points-of-interest standing out against simple-looking backgrounds and basic foregrounds. The cut-scenes and alien interaction scenes are slightly better but still not anything spectacular. 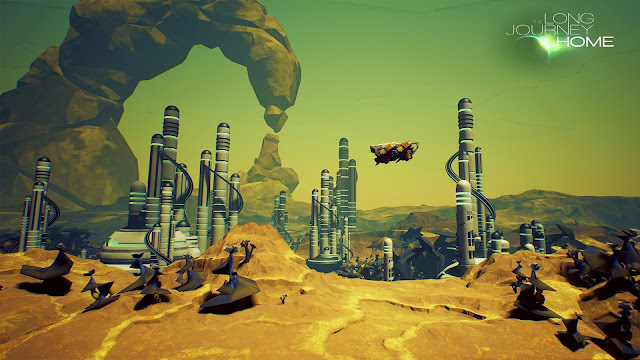 The game is never ugly, everything that is shown looks decent, the aliens and their ships are particularly interesting but wouldn't look out of place on a game of the last generation (or even the one before that). 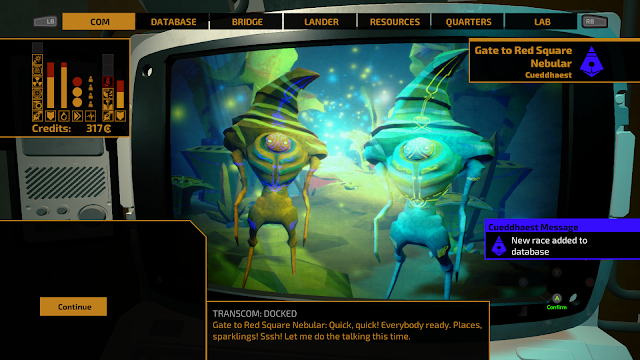 It makes up for this with content though, there are a huge variety of missions, quest-lines and aliens to meet and not every seed can have every quest, not every crew member can do every mission and some are unique to one individual only. That makes long-term replayability the name of the game. You'll need many multiple runs, across many multiple seeds to see and do it all. Question is, do you want to push through the difficulty and the lack of explanation to do it? I know I do (and will), but can see that this is a niche title, one that won't be for everyone but is an engaging, if flawed, title that has an interesting take on the whole space exploration concept. So to summarize - It's a procedurally generated space exploration game with resource management. You'll search a 2D representation of space as you mine, trade, investigate, quest and, mostly importantly, travel as you attempt to guide your crew safely home. A simple aesthetic covers a rather difficult game, one that will take time to really see and enjoy. If you're looking for a quick one-and-done, this probably isn't a good choice. As a long-term challenge type of game, however, I'd cautiously recommend it, especially in a sale. Even though the game can be frustrating, it's one you can return to time and time again, always see something different, and will probably discover an interesting story or two to boot. Really wanted to love this one but it's just so brutal! It's good but everything is always just enough, even on the lowest difficulty, it feels like you never get a decent start. Still see the potential but it's for longer play times, it would take ages to work everything out for yourself. It could do with better balancing I think. People would be easily put off.